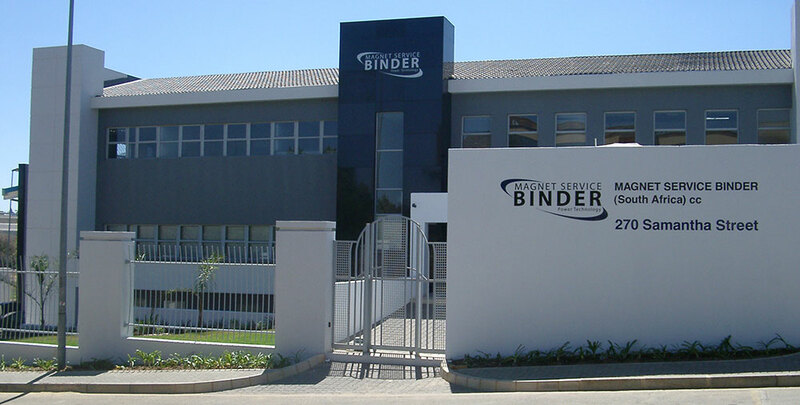 Magnet Service Binder (South Africa) cc is the sole distributor of all Binder, Kendrion, Siegerland, Linnig and Merobel brake products in Africa, we are also the distributor of Binder solenoids, Wistro Force cooling and EMG thrusters. Our company has served the market since 1981 and has a wide knowledge of components such as clutches, brakes, drum brakes, disk brakes, force cooling permanent and electromagnets as well as A.C/D.C solenoids. Our products are held in large quantities ensuring the shortest possible delivery time. Our innovative Team of 30 employees can react quickly to market changes and special customer requirements. With our staff’s strong technical knowledge we can solve most of your braking and access control needs or requirements. We also offer an extensive service to our customers by fitting brakes to motors, extension of fan cowls and fitting of force cooling to motors to mention a few. All these processes are being continuously supervised by a quality assurance system to ISO 9001 standard.